The Global Volcanism Program has no activity reports for Jom-Bolok. The Global Volcanism Program has no Weekly Reports available for Jom-Bolok. The Global Volcanism Program has no Bulletin Reports available for Jom-Bolok. A group of small basaltic cinder cones about 200 km WNW of the SW tip of Lake Baikal form the Jom-Bolok volcanic field. A N-S fissure fed a massive 7.9 km3 alkalic-basalt lava flow that traveled 70 km down the Jom-Bolok (Zhom-Bolok) River about 7130 years BP. A smaller younger but undated lava flow originated from a nearby fissure to the SW. This area is part of the East Sayan volcanic region. Holocene activity took place in the Todzha Basin, which is separated by the Great Sayan Ridge from the Oka Plateau to the southwest, with volcanic activity of early Miocene to early Pliocene age. There is no Deformation History data available for Jom-Bolok. There is no Emissions History data available for Jom-Bolok. The rugged surface of the Jom-Bolok (Zhom-Bolok) lava flow fills the valley of the Oka River. 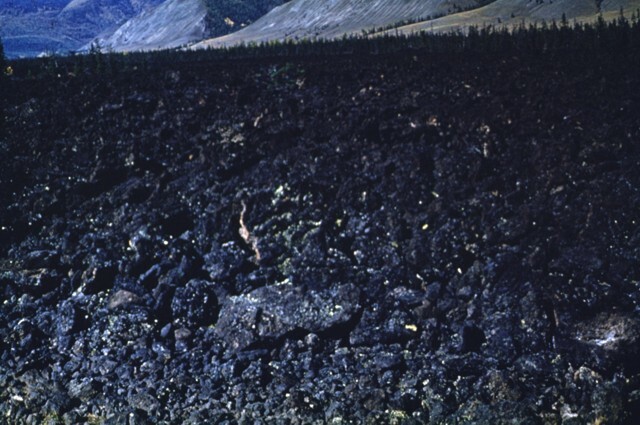 The massive Holocene lava flow traveled 70 km from its source, a cinder cone of the Jom-Bolok volcanic field near the Oka Plateau west of Lake Baikal. Photo by Jim Luhr, 1991 (Smithsonian Institution). A group of small basaltic cinder cones were erupted from the Jom-Bolok volcanic field near the Oka Plateau, about 200 km WNW of the SW tip of Lake Baikal. Two of the cinder cones are seen here from the SE. The eroded cone at the lower right is Stariy. 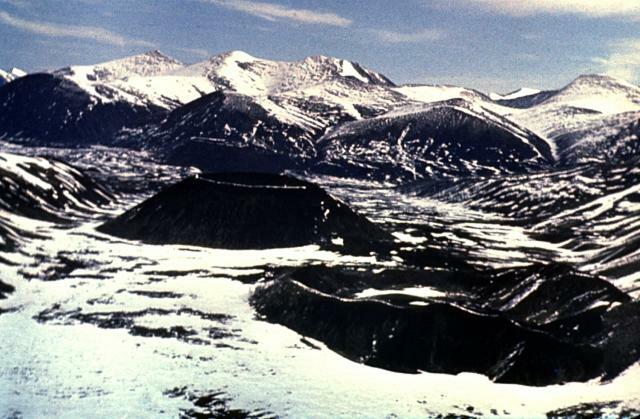 The young cone (left center) is Peretolchin volcano, named after a geologist who disappeared in the early 20th century, prior to the Russian revolution. 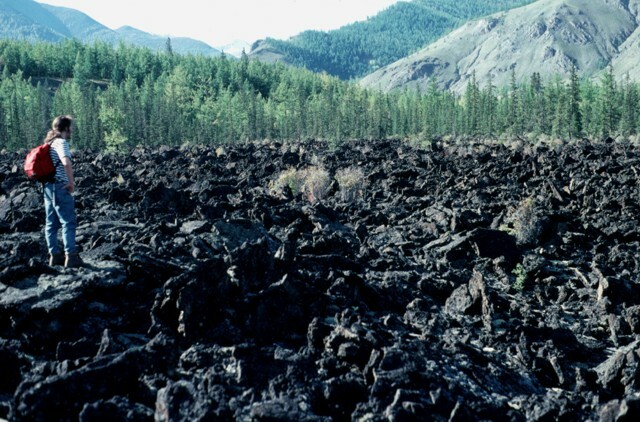 Peretolchin cone was the source of the voluminous 70-km-long Jon-Bolok (Zhom-Bolok) lava flow, one of the world's longest Holocene lava flows. Photo by Sergei Rasskazov, 1995 (Siberian Branch, USSR Academy of Sciences). The massive Jom-Bolok (Zhom-Bolok) lava flow, which traveled about 70 km down the Oka River, is seen here near its terminous, where it is 1.5 km wide. An earlier lava flow that was dated at 12,000 +/- 4000 years by thermoluminescence was erosionally dissected, after which the Holocene Jom-Bolok flow traveled down a gorge cut in the older flow. Large Eruptions of Jom-Bolok Information about large Quaternary eruptions (VEI >= 4) is cataloged in the Large Magnitude Explosive Volcanic Eruptions (LaMEVE) database of the Volcano Global Risk Identification and Analysis Project (VOGRIPA).